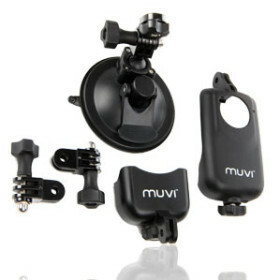 MUVI™ Universal Suction Mount » Protective Solutions, Inc. The MUVI™ Universal Suction Mount for MUVI™ and MUVI™ HD is a short based suction mount that will attach to almost anything flat and is designed to hold. Shipped with the suction mount is the stand MUVI™ HD holder, a protective skin holder, 2 way angle connector and tripod mount.